It gives me great pleasure to announce that starting next Term, Napperby Primary School will be offering a lunch order service for families. Attached is a copy of the lunch order menu. 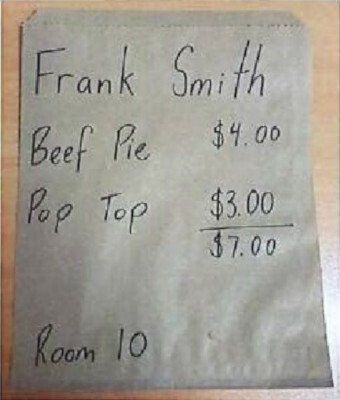 A student’s order must be written on a large brown paper lunch bag like the example below. Families are responsible for supplying their own lunch bags. These can be purchased from Coles and Woolworths. Students will need to place their lunch order in the lunch order box before 9:00am. The lunch order box will be located in the Front Office. Lunch Orders will be delivered to the school at 1:10pm for regular eating time.